Nature is a water-mediated ecosystem. Through water Nature builds and demolishes as it enables life and guides material transformation over time. Omnipresent in inanimate and living matter, water is Nature’s construction medium that gives shape, structure, and function to all organisms and natural formations; from the Great Barrier Reef single-cell micro-organisms generating energy through photosynthesis. And, to the ancients, water has been known to precede creation itself. Inspired by aqueous material formation, the Water-based Digital Fabrication Platform offers a new perspective on water-based manufacturing, combining an age-old crustacean-derived material with robotic fabrication and synthetic biology to form constructs that utilize graded material properties for hydration-guided self-assembly. A robotically controlled multi-chamber extrusion system is designed to deposit biodegradable composites with functional, mechanical and optical gradients across length scales. A seamless computational workflow is implemented for the design and direct digital fabrication of multimaterial and multi-scale structured objects. The workflow encodes for, and integrates, domain-specific meta-data relating to local, regional, and global feature resolution of heterogeneous material organizations. Geometrically diverse constructs associating shape-informing variable flow rates and material properties to mesh-free geometric primitives are deposited. The structures are made of a single material system derived from chitin the most abundant renewable polymer in the ocean, and the second most abundant polymer on the planet. Ground arthropod shells are transformed into chitosan, a chitin derivative, to form a variable property aqueous solution. Once printed, constructs are form-found through evaporation patterns given by the geometrical arrangement of structural members, and by the hierarchical distribution of material properties. Controlled wrinkling follows. Each component will find its shape upon contact with air, and biodegrade upon contact with water. Living matter in the form of Cyanobacteria is coated and impregnated onto chitosan samples to enable surface functionalization and impart additional properties such as water resistance and conductivity. Applications include the fabrication of fully recyclable products or temporary architectural components such as tent structures with graded properties. Proposed applications demonstrate environmental capabilities such as water storing structures, hydration induced shape forming and product disintegration over time. Derived from the ocean, shaped by water, and augmented by photosynthetic marine bacteria, these structures represent the transformation of a marine arthropod’s shell into a treelike chitosan made skin that will ultimately convert sunlight into biofuel. The platform and its products demonstrate the Material Ecology approach to shape and property formation by design. It is a realization of the ancient biblical verse ‘from Earth to Earth’, from water to water. 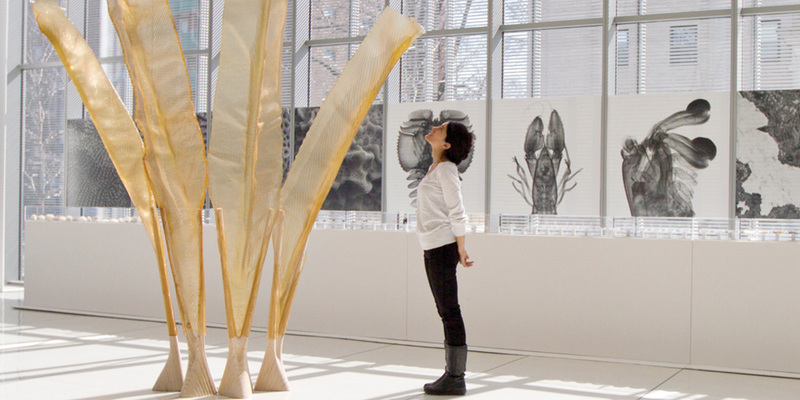 The Mediated Matter Research Group (US) focuses on Nature-inspired Design and Design-inspired Nature. We conduct research at the intersection of computational design, digital fabrication, materials science, and synthetic biology and apply that knowledge to design across scales from the micro scale to the building scale. We create biologically inspired, informed, and engineered design fabrication tools and technologies and structures, aiming to enhance the relation between natural and man-made environments. Our research field, entitled Material Ecology, integrates computational form-finding strategies with biologically inspired fabrication. Neri Oxman, Architect, Designer, and Associate Professor at the MIT Media Lab, heads the Mediated Matter Research Group.